A few weeks ago, I popped up a Tweet about wanting to collaborate with another blogger, and the lovely Becky from Hideaway replied. After a few days of sending emails back and forth, we decided to do a Halloween post, but were a little stuck as to what to focus on. Then Becky had the fantastic idea of doing a baking post – it was perfect. We both chose what we were going to make, and then got baking. 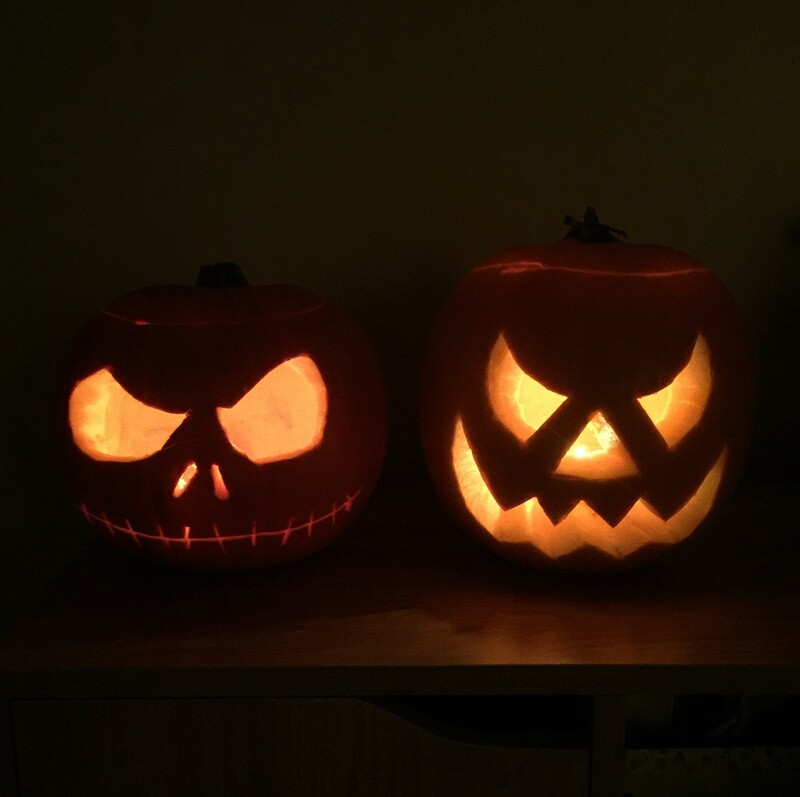 You can check out Becky’s fantastic Halloween baking post, here. I might love baking, but I must admit that decoration really isn’t my strong point. I can bake delicious cakes – gooey brownies are my specialty, but when it comes to pipping a cupcake, it very rarely goes to plan. Preheat the oven to 180c / Gas 4 and line cake tin with 12 paper cases. Instead of beating the eggs together, split them, put the yolks into the butter and sugar mix and beat. Use a electric hand whisk to whip the egg whites until they form stiff peaks – I find this makes the sponges lighter. Once they have become white and fluffy, gently fold the egg whites in with the other ingredients and add a few drops of vanilla essence and red food colouring. Next, slowly add the flour, using a sieve to remove any lumps. Fold in the flour and keep mixing in a figure of eight motion until there is no flour visible. Then add the milk to make the mixture a little looser. Using two teaspoons, put the mixture into the 12 cake cases, ensuring that each case has the same amount of the mixture in. Pop the cakes in the oven for 10-15 minutes. Once golden remove them and check that the centre is cooked by inserting a skewer. Allow to cool for 10 minutes, then remove from tin and place on a metal cooling rack. Mix a few drops of green food colouring into the marzipan and mix well to create green marzipan. Sprinkle the work top with icing sugar and roll the marzipan out – it needs to be half a centimeter thick. Using a circular cutter – this should be smaller than the top of the cakes, cut 12 circles. Pop a spoonful of apricot jam on top of each cake and then place the marzipan circle on top of it. If the icing is a little loose, pop it in the fridge for 15 minutes to firm up. Spoon the icing into the piping bag with a star-shaped nozzle attached and use a spiral motion to pipe swirls of icing on top of the marzipan circles. Preheat the oven to 180c or Gas 5 and line a baking tray with greaseproof paper. Cream the butter and sugar together by hand or using a whisk. Beat the egg and mix with vanilla essence, then add to the mixture.Slowly add the flour using a sieve. Stir it in bit by bit, until the mixture forms a dough. Flour the worktop, roll the dough into a ball and then use a rolling pin to roll the mixture out. Once rolled, the dough should be around 1.5cm thick. Using your ghost cutter, carefully cut shapes out of the dough, placing each one on the lined baking tray. Pop the biscuits in the oven for 8-10 minutes and cook until golden brown. Allow them to cool and harden for 10 minutes, then place on a wire cooling rack. Spoon the marshmallow Fluff into a piping bag and pipe onto each biscuit, leaving half a milimetre around the edges. Once you have covered the biscuit in marshmallow, use a knife to even the surface out. Then, use the black tube of icing to create two small black dots on the head for eyes. 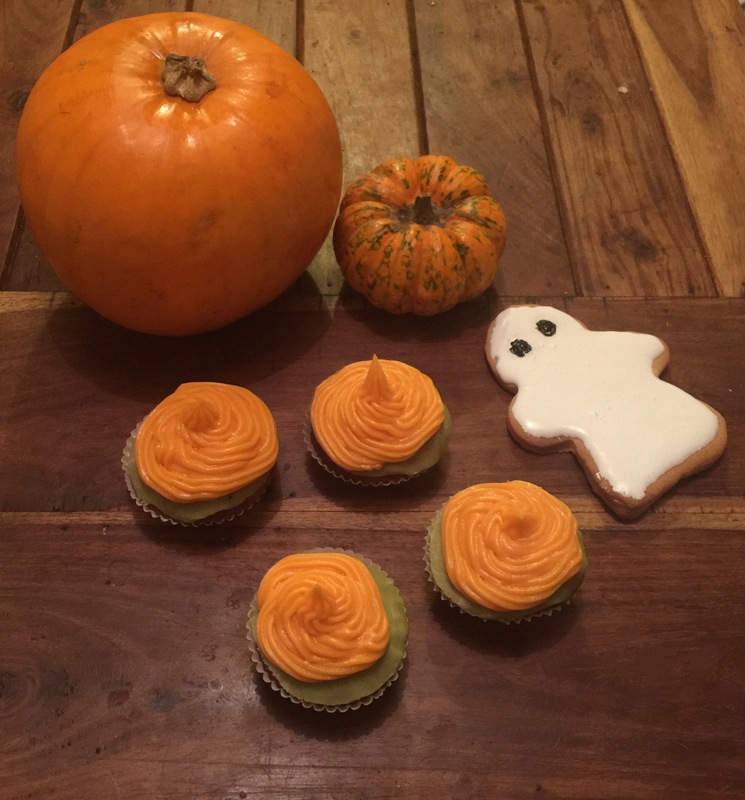 If you have a spare couple of hours, why not bake some of your own Halloween cupcakes and biscuits, they’re actually pretty simple to make. (If you do decide to give either of these a go, make sure to send me a picture!) Oh, and don’t forget to check out Becky’s blog, here – she has some fantastic posts. *Recipes originally from BBC Food but have been tweaked a little. Previous Article← Here’s Why Autumn Is My Favourite Time Of Year! Tech Tools: What’s Best For Your Business?